The capital city of Kiev oblast. 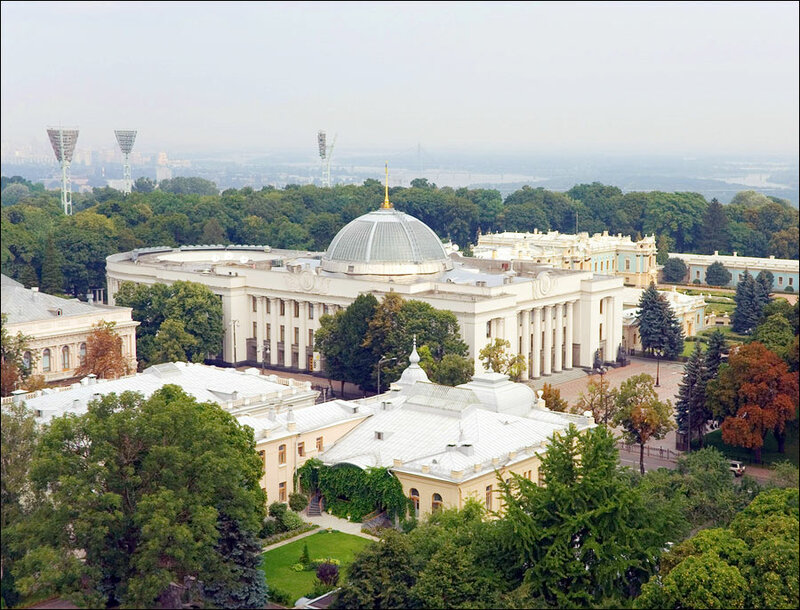 Related articles: Kiev Olympic - Euro 2012 stadium, Kiev secret places guide 1, Kiev secret places guide 2. Kyiv (Kiev in Russian) is the capital and the largest city of Ukraine located on the Dnieper River, in the north of the central part of the country. 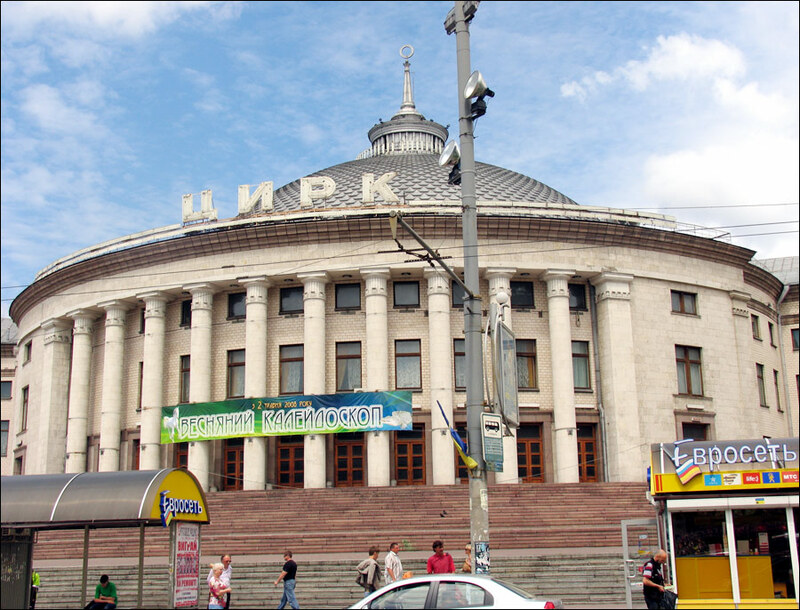 It is the largest cultural, political, socio-economic, transport, scientific, and religious center of Ukraine. The city is the administrative center of the Kyiv region although it does not belong to it, being a separate administrative-territorial unit of Ukraine. The population of Kyiv is about 2,928,000 (2016), the area - 847 sq. km. The phone code - +380 44, the postal codes - 01001-06909. Local time in Kiev city is April 21, 5:35 pm (+2 UTC). 18 February, 2019 / The Golden Gate of Kyiv. 13 February, 2019 / Children Landscape Park - One of the Must See Places in Kyiv. 22 December, 2018 / Snowy Winter in the Pyrohiv Museum. 24 April, 2018 / Gate Church of the Trinity in Kyiv. Archaeological excavations show that settlements on the territory of the Kyiv region existed already 15,000-25,000 years ago. According to legend, Kyiv was founded by three brothers Kyi, Shchek, and Khoryv and their sister Lybid as the center of the Polyan tribe and named in honor of the older brother in the middle of the 5th century AD. However, the exact date of the founding of Kyiv is not known. At the end of the 9th century, Askold and Dir, who were either the guardsmen of the Varangian Rurik or the descendants of Kyi, reigned in Kyiv. In 882, the town was conquered by a relative of Rurik, Novgorod prince Oleg, who moved his residence there. From this moment Kyiv became the capital of Kievan Rus, a federation of East Slavic tribes. In the beginning of the 11th century, according to the German Titmar Merseburgsky, Kyiv was a large town with 400 churches and 8 markets. Kyiv reached its “golden age” during the reign of Yaroslav the Wise in the middle of the 11th century. In the early 1070-ies, Adam Bremensky called it the rival of Constantinople. Kyiv remained the real political center of Kievan Rus, at least until the death of Vladimir Monomakh and his son Mstislav the Great (1132). In the period of fragmentation, Kyiv formally continued to be considered the main center of Rus and was a permanent object of struggle between rival princes, which greatly weakened it. During the internecine wars of the 1230s, the town was repeatedly besieged and ruined. In 1240, Kyiv was captured and destroyed as a result of the Mongol siege, during which a large number of local residents were killed and many buildings were destroyed. Later, the Kyiv Principality continued to exist under the Mongol yoke, however, the town lost its importance as an economic, political, and religious center of the Russian lands, which further led to the rise of Moscow, the capital of the Moscow principality. A new period in the history of Kyiv began with the victory of Lithuanians in the battle on the Irpen River, which occurred around 1324. The Grand Duke of Lithuania, Gedimin, defeated the army of the Grand Duke of Kyiv, Stanislav Ivanovich, and the Kyiv Principality fell into the sphere of influence of Lithuania. From 1362 to 1569, Kyiv was part of the Grand Duchy of Lithuania, from 1569 to 1654, it was part of the Polish-Lithuanian Commonwealth. In 1654, with the beginning of the Russian-Polish war, in the town there was an anti-Polish uprising and Kyiv passed under the influence of the Moscow tsar. It was officially confirmed in the Andrusov truce of 1667. 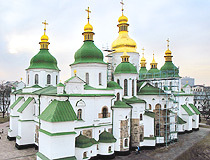 Since 1667, Kyiv continued to play an important role as one of the cultural and religious centers of the Russian state. At the end of the 17th century, the territory of the town was located only on the right bank of the Dnieper. The 18th century became the century of intensive development of Kyiv and the emergence of many of its architectural masterpieces. December 18, 1708, the Kyiv province was formed with the center in Kyiv. In 1811, one of the largest fires in the history of Kyiv occurred, more than 2,000 houses, 12 churches, 3 monasteries were destroyed. Even after Kyiv ceased to be part of Poland, the Poles made up a considerable proportion of the town’s population, about 10%. Until the middle of the 18th century, the town was experiencing a significant influence of Polish culture. 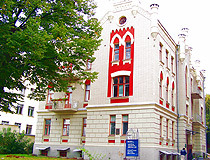 In 1834, to counter Polish cultural influence, the Imperial University of St. Vladimir (Kyiv National Taras Shevchenko University today) was founded. During the Russian industrial revolution of the late 19th century, Kyiv became an important center for trade and transport of the Russian Empire. This economic and geographical region specialized in sugar and grain exports by rail and along the Dnieper. In 1900, the city became a large industrial center with a population of about 250,000 people. At that time, a large Jewish community arose in Kyiv. This was caused by the ban of Jewish settlements in the more eastern regions of the Russian Empire (for example, in Moscow and St. Petersburg). In 1892, the first electric tram line in the Russian Empire was opened in Kyiv. The sports field, the first stationary stadium in the Russian Empire, was built in 1912. In 1911, while visiting the Kyiv Opera, the Russian Prime Minister Pyotr Stolypin was mortally wounded by the anarchist Dmitry Bogrov. In 1917-1920, power in Kyiv changed more than ten times. 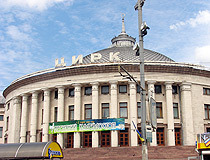 For a short time the city became the capital of an independent Ukraine. June 12, 1920, Kyiv became part of the Ukrainian SSR. In 1934, the capital of the Ukrainian SSR was moved from Kharkiv to Kyiv. During the Second World War, in September 1941, Kyiv was surrounded by German troops and captured, more than 600,000 soldiers and commanders of the Red Army were taken prisoner. In 1941-1943, Syretsky death camp was located in the area called ? ?Babi Yar. During the occupation, more than 100,000 inhabitants of Kyiv and prisoners of war were shot there. More than 100,000 young people were sent to Germany for forced labor. By the end of 1943, the city’s population decreased to 180,000. November 6, 1943, the capital of Soviet Ukraine was liberated by the Red Army. After the war, it was decided to rebuild Khreshchatyk, the main street of Kyiv, preserving the configuration of the streets, but the buildings were built entirely new, in the style of the “Stalin Empire.” Kyiv remained the center of development of Ukrainian national culture. In 1960, the Kyiv metro began its work, the population of the city exceeded 1 million people. In 1973, the construction of the Kyiv TV Tower was completed. In 1979, the city’s population was 2.12 million people. In these years, new residential areas appeared on the left bank of the Dnieper, the Museum of the History of the Great Patriotic War was opened with a 62-meter statue of Motherland, which became one of the symbols of Kyiv. April 26, 1986, despite the accident at the Chernobyl nuclear power plant, located about 100 km north-west of the city, festive celebrations and demonstrations were held in Kyiv, timed to the First of May. Information about it was concealed to avoid panic among the population. 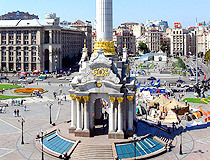 Since August 24, 1991, Kyiv is the capital of independent Ukraine. November 22 - December 26, 2004, Kyiv was the place of the so-called Orange Revolution - mass protests on the Independence Square against falsification of the results of the presidential elections. As a result, Victor Yushchenko became the president of Ukraine. In 2005 and 2017, Kyiv became the venue for the 50th and 62nd Eurovision Song Contest. In 2012, it was one of four Ukrainian cities that hosted the European Football Championship 2012. In late 2013 and early 2014, Kyiv became the place of the main events of EuroMaidan - a massive multi-month protest, which began in response to the suspension of preparation for signing an association agreement between Ukraine and the European Union. These events led to the resignation of the pro-Russian president Viktor Yanukovych. Ukraine has adopted a policy of active rapprochement with the European Union and the severance of ties with Russia. March 11, 2016, in Kyiv, 79 boulevards, streets, squares, and lanes were given new names under the law on decommunization. In Slavic languages, the second vowel in the name of this city varies considerably. In Russian it is called “Kiev”. And since it was part of the Russian Empire and the USSR for a long time, the Russian name of the city was used in non-Slavic languages and in English the name Kiev became generally accepted. After Ukraine gained independence, the authorities ordered to use the Ukrainian names despite the established traditions. This affected, in particular, the English name of Kiev, a new name of the city appeared - Kyiv. Today, it is still not quite usual for English speakers, and therefore it is used less often than Kiev. However, this situation is gradually changing. Kyiv is the seventh most populous city in Europe after Istanbul, Moscow, London, St. Petersburg, Berlin, and Madrid. Due to its importance as the historical center of Rus, it is also known as “the mother of Russian towns”. 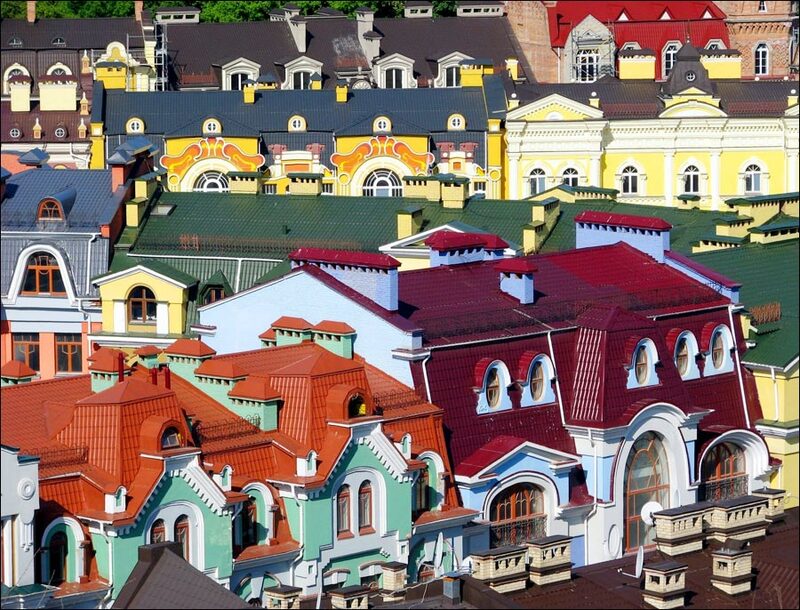 This city is located in the northern part of Ukraine, relatively close to its center. In general, the climate is moderately continental with mild winters and warm summers. The average temperature in January is about minus 3.5 degrees Celsius, in July - plus 20.5 degrees Celsius. Among the characteristic features of Kyiv is a large number of green plantations. One of the symbols of the city is a chestnut leaf. Forests, parks, and gardens make up more than half of Kyiv’s area, about 80,000 hectares. 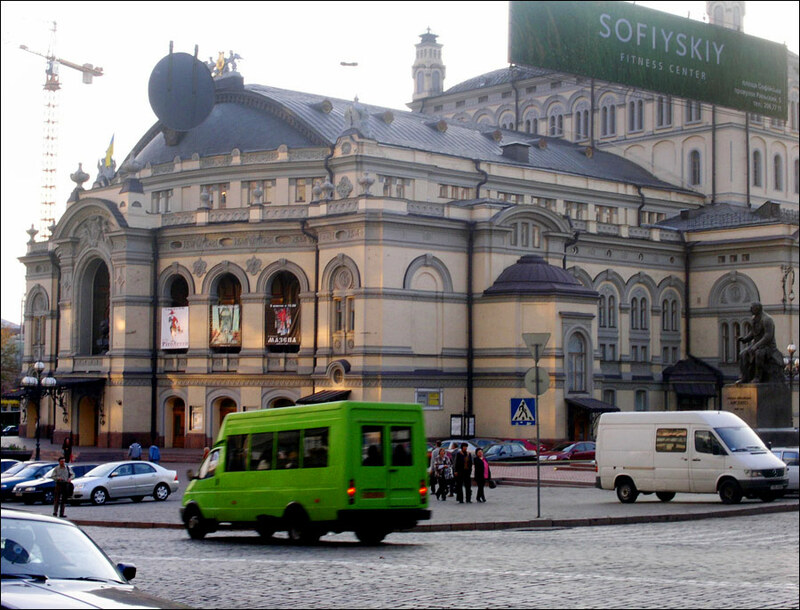 Kyiv is a major transport hub (railways and highways, river port, airports). The city has a metro, bus, trolleybus, tram networks, and even a funicular. The international airport “Boryspil”, located about 30 km southeast of Kyiv in the town of Boryspil, is the largest airport in Ukraine and the main international gates of the country. Navigation on the Dnieper is carried out nine months a year. Kyiv is a large industrial center of Ukraine with enterprises of light and food industry, printing, pharmaceuticals, engineering, metallurgy, aircraft building. The services sector makes the main contribution to the local economy - transport and communications, small and wholesale trade, real estate, legal and financial services. The key growing sectors of the economy are retail trade, information technology, finance. An important role is played by the tourist business. Also there is a developed construction industry. The city is one of the largest centers of science and education in Ukraine. 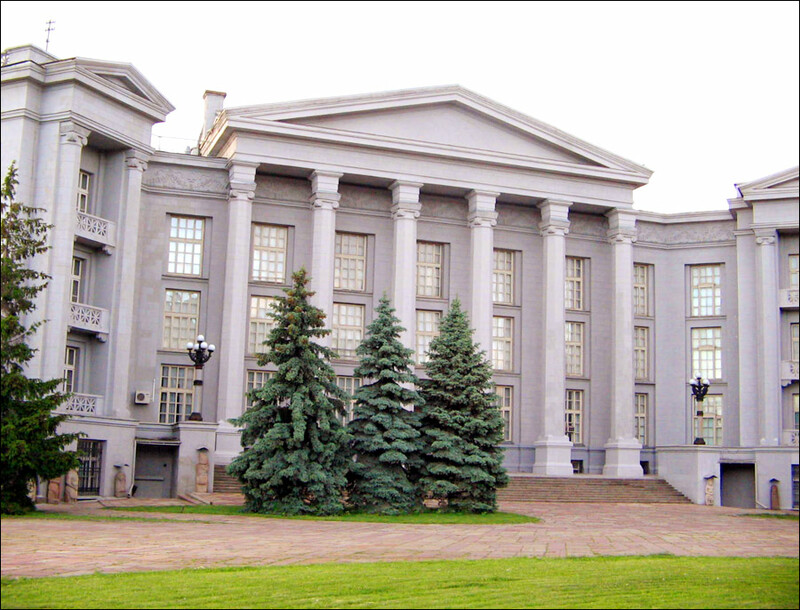 There is a large number of higher and secondary special educational institutions, including several universities of international importance, in particular the three most prestigious universities of Ukraine: Kyiv National Taras Shevchenko University, Kyiv Polytechnic Institute named after Igor Sikorsky, and the National University “Kyiv-Mohyla Academy”. The City Day of Kyiv is celebrated on the last weekend of May. 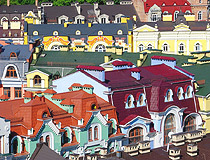 Kyiv is a city rich in monuments of culture, architecture, and art. Dozens of museums and theaters are located here. The following are the most interesting sights. Kyiv Pechersk Lavra. The oldest monastery of Rus, the main center of Russian Orthodoxy, an object of world cultural heritage under the protection of UNESCO. The monastery was founded by the Monk Anthony of Caves as a cave monastery in 1051. The Great Lavra Bell Tower (96.5 meters, 374 steps), built in 1731-1745, is open for visiting. 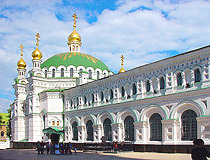 There are several museums on the territory of the Lavra: the Museum of Microminiatures of N. Syadristy, the Museum of Jewelry, the Museum of Ukrainian Folk Decorative Arts, the Museum of Books and Printing, the Museum of Theater, Music and Cinema (tickets are sold at the entrance to each museum). At the entrance to the Lavra there is a tour desk, guide books are available in different languages. When visiting churches and caves, women should be in skirts below knees and with covered heads (at the entrance to the caves there is skirt rental). Lavrska Street, 15. Opening hours: 9:00-19:00 (in winter - 9:30-18:00). St. Sophia’s Cathedral. The oldest surviving architectural monument of Rus, one of the largest Christian churches of its time. 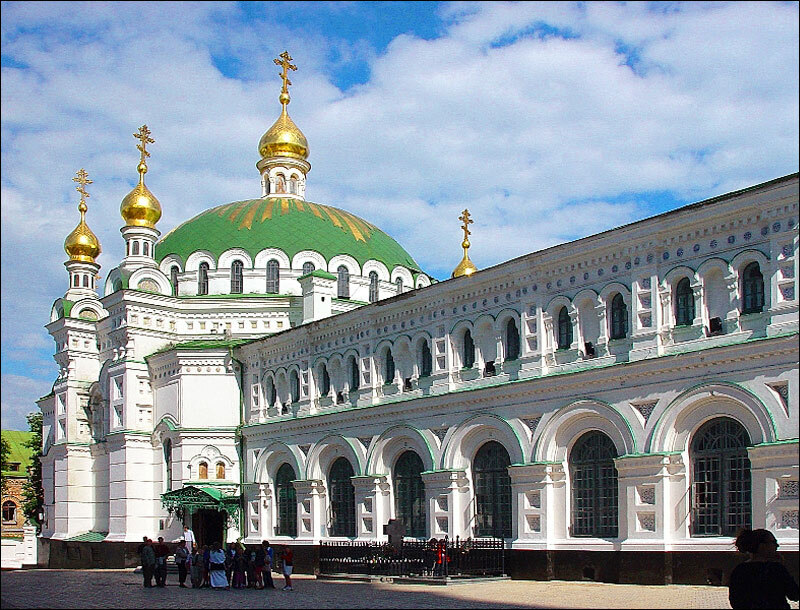 The cathedral was founded by the Kyiv prince Vladimir the Great in 1011. This grandiose building with a very complex structure was built by Byzantine masters after the model of St. Sophia’s Cathedral in Constantinople. The present style of Ukrainian baroque appeared after the reconstruction carried out in the 17th century. 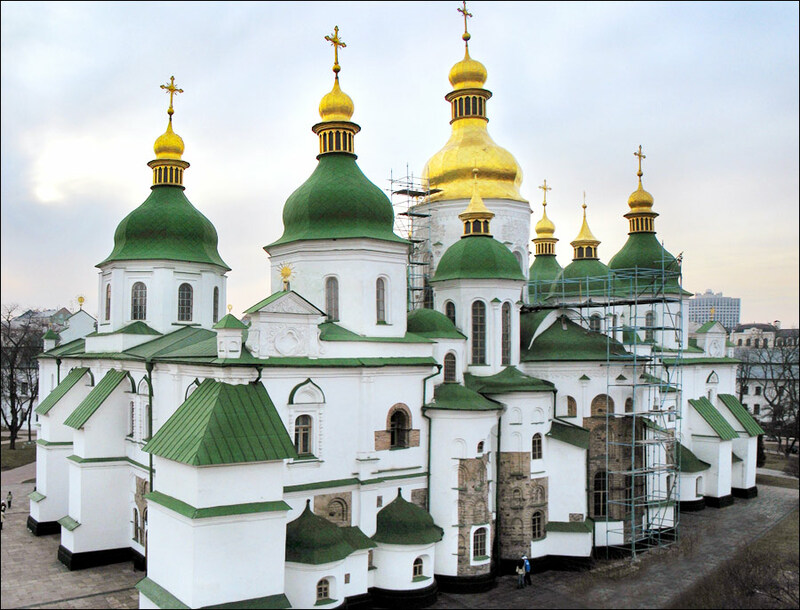 Today, St. Sophia Cathedral has the status of a national reserve, listed in the UNESCO World Heritage List. Around the cathedral you can find monastery buildings of the 17th-18th centuries. Volodymyrska Street, 24. Opening hours: 10:00-17:30. St Andrew’s Church (1749-1754) - a beautiful Orthodox church in honor of the Apostle Andrew the First-Called, built in the Baroque style by the architect Bartolomeo Rastrelli on the Andriivs’kyi Hill. The church stands on the steep right bank of the Dnieper, over the historical part of the city - Podil. Down from it goes Andriivs’kyi Descent, connecting the upper city with the lower one. Andriivs’kyi Descent, 23. Opening hours: 10:00-19:00. St. Volodymyr’s Cathedral (1862-1896) - a classic example of the Russian-Byzantine style in the church architecture. The height of the cross of the main dome is 49 meters. 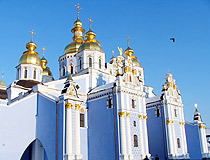 Since 1992, it is the main church of the Ukrainian Orthodox Church of the Kyiv Patriarchate. Tarasa Shevchenko Boulevard, 20. Opening hours: 9:00-18:00. St. Michael’s Vydubytsky Monastery - one of the first Kyiv monasteries, founded by the Kyiv prince Vsevolod Yaroslavich in the Vydubychi tract in the 1070s. It is located on the territory of M. M. Hryshko National Botanical Garden. Vydubyts’ka Street, 40. St. Cyril’s Church - a unique monument of architecture and monumental painting founded by the Kyiv prince Vsevolod Olgovich in the first half of the 12th century. In the 17th-18th centuries, the church acquired the features of Ukrainian baroque. There are unique frescoes of the 12th century. Oleny Telihy Street, 12. Opening hours: 10:00-17.30. Day off: Friday. St. Michael’s Golden-Domed Cathedral. 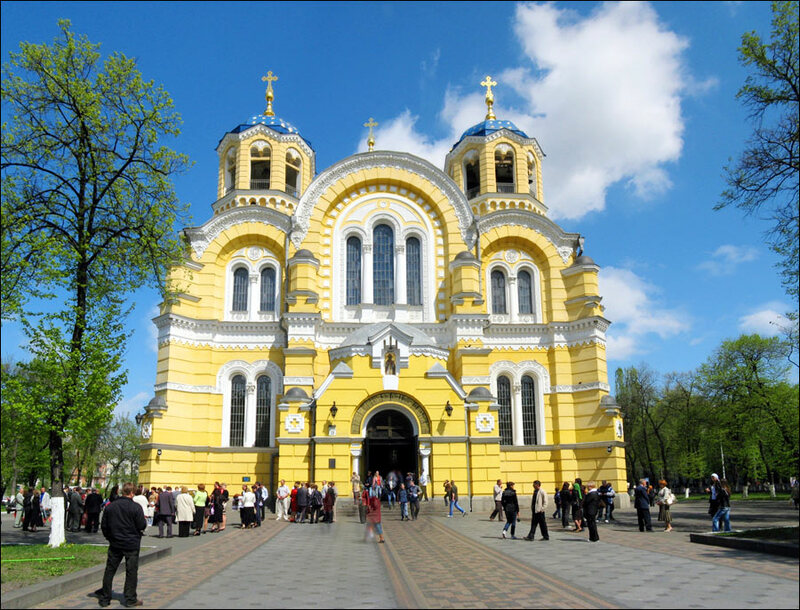 The cathedral was built by the Kyiv prince Svyatopolk (Michael) Izyaslavich in the 12th century. 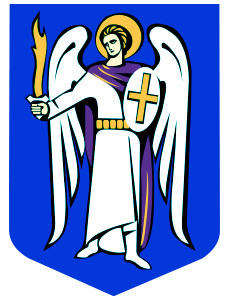 It was dedicated to the Archangel Michael - the protector and patron of Kyiv. Almost completely destroyed under Soviet rule in 1934-1937, it was rebuilt in 1999. Triokhsviatytelska Street, 6. St. Pokrovsky Convent. The main building of the convent is a magnificent cathedral of St. Nicholas (1911), designed by the architect V. Nikolaev in traditional forms of Old Russian architecture. 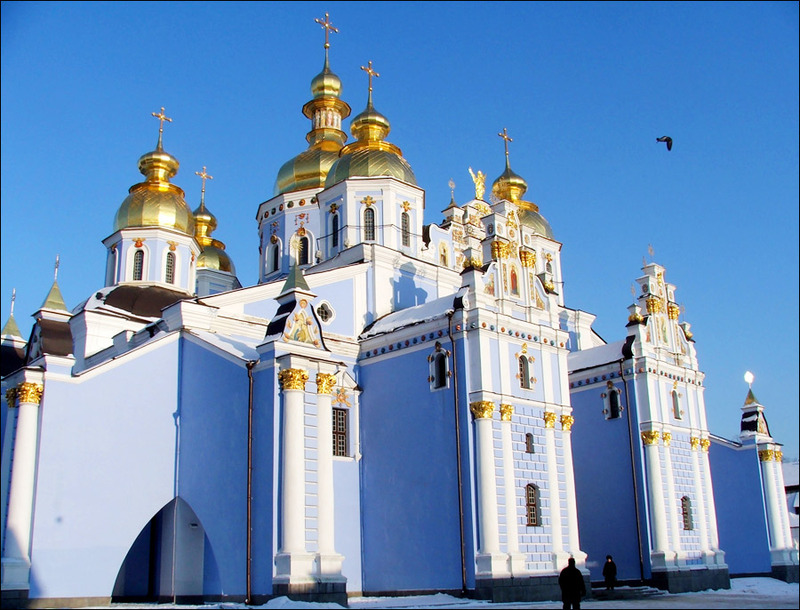 This is the largest church in Kyiv (58x38 meters), which can accommodate more than 2 thousand people. The height of the 15-dome church reaches 64 meters. Bekhterevs’kyi Lane, 15. St. Nicholas Roman Catholic Cathedral (1909). The cathedral was built by the order of the Catholic community of Kyiv and became one of the first buildings in the construction of which reinforced concrete was used - a new building material at that time. Two 60-meter towers in the style of medieval Gothic are richly decorated with sculptures of artificial stone. Since the Soviet times, the cathedral has been used as the House of Organ and Chamber Music. Today, it is National House of Organ and Chamber Music of Ukraine. In 1992, divine services have been resumed. Velyka Vasylkivska Street, 75. Feofaniya Park. This picturesque landscaped area with five lakes located on the southern outskirts of Kyiv has the status of a monument of landscape art. It is beautiful at any time of the year. Akademika Lebedjeva Street. Botanical Garden named after N.N. 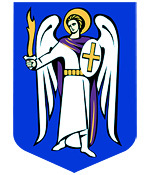 Grishko. The garden occupies an area of about 130 hectares and shows the flora of different parts of Ukraine, the collection of plants has more than 10 thousand species. There is a greenhouse complex with exotic tropical and subtropical plants. The park is especially popular in spring, during the flowering of lilacs (more than 200 species). Tymiriazievska Street, 4. Opening hours: 8:00-21:00 (in winter - until dusk). Khreshchatyy Park. This park located on a hill offers picturesque views of the Dnieper River and Kyiv. In the water tower (1877), there is the Water Museum. 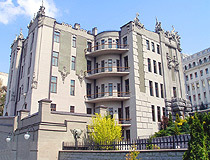 The building resembling a fairy-tale castle located nearby is a new building of the Kyiv Academic Puppet Theater (2005). Here you can also find the 60-meter Park Bridge (1912) known as the Bridge of Lovers - one of the most romantic places in Kyiv. Yevropeis’ka Square. Pechersk Landscape Park (also known as Pevcheye Pole - “the field for singing”). The park is located on the slopes of the Dnieper on an area of 30 hectares, between the Kyiv-Pechersk Lavra and the complex of the National Museum of the History of the Great Patriotic War. Flowers exhibitions and music festivals are held regularly here. Opening hours: 9:00-21:00. Ukraine in Miniature - a miniature models park located in a picturesque place near the center of Kyiv, on the Hydropark Island. Here you can see miniature models of the most famous sights of Ukraine. 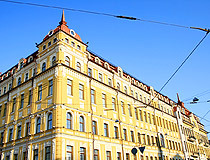 Brovarskyi Avenue, 9V. Opening hours: 10:00-19:00 (in summer), 10:00-17:00 (in winter). Arboretum Syrets - a monument of landscape art located relatively far away from the center of Kyiv. This quiet park has an area of 6.5 hectares. It does not have its own entrance. To get to its territory, you need to go through the entrance of the agro-company “Kvity Ukraine”. Volodymyra Salskoho Street, 43. Opening hours: 10:00-17:00 (Saturday, Sunday: 10:00-16:00). National Museum of Folk Architecture and Life “Pyrohiv” - one of the largest open-air museums in the world known for its picturesque rural landscapes and monuments of wooden architecture representing different regions of Ukraine. In total, there are more than 300 wooden buildings of the 17th-20th centuries. Pyrohiv village. Opening hours: 9:00-17:00. Day off: Wednesday. 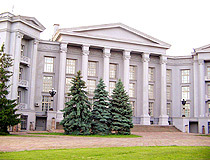 National Museum of the History of Ukraine in the Second World War. This grandiose memorial complex was built in 1981. The colossal 62-meter statue of the Motherland (102 meters with the pedestal), made of special stainless steel, is one of the symbols of Kyiv. There is an an observation deck inside the statue. The museum has an interesting exhibition of military equipment and weapons. Lavrska Street, 27. Opening hours: 10:00-17:00. Day off: Monday. Oleg Antonov State Aviation Museum of Ukraine - the largest technical museum in Ukraine, located near the airport “Zhulyany”. The museum has almost all main types of aircraft of the Soviet civil and military aviation. In total, the museum has more than 70 aircraft and helicopters, as well as missiles, weapons, engines. Medova Street, 1. Opening hours: 10:00-19:00 (in winter - 10:00-16:00). 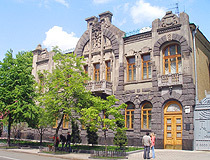 National Museum of the History of Ukraine. In total, there are more than 700 thousand exhibits, which reflect all periods of development of society in Ukraine. In particular, there are archeological and numismatic collections, ethnographic collections, collections of weapons, monuments of decorative and applied art, manuscripts, old printed books, paintings and graphics. There is also a unique collection of Scythian gold. Volodymyrska Street, 2. Opening hours: 10:00-18:00. National Art Museum of Ukraine - one of the oldest and largest museums in Ukraine with a unique collection of paintings and sculptures (about 40 thousand exhibits). Mykhaila Hrushevskoho Street, 6. Opening hours: 10:00-18:00. Days off: Monday, Tuesday. National Museum of Natural Sciences of Ukraine. 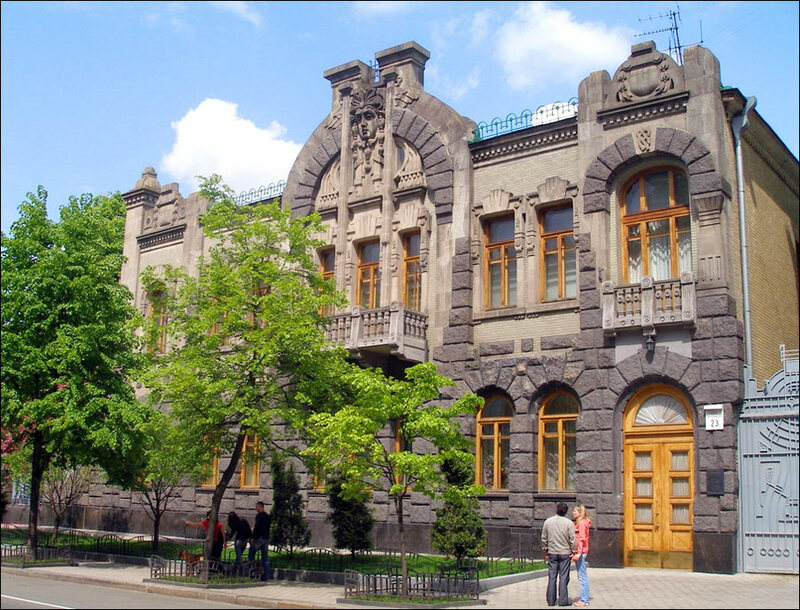 This museum in the center of Kyiv includes 5 museums: archaeological, geological, paleontological, zoological, and botanical. More than 30 thousand exhibits tell about the origin of the Earth, its structure and evolution, flora and fauna, as well as the history of material culture of tribes and peoples, who lived on the territory of Ukraine. Bohdana Khmel’nyts’koho Street, 15. Opening hours: 10:00-17:00. Days off: Monday, Tuesday. Chernobyl Museum. The exposition is devoted to the accident at the Chernobyl nuclear power plant, which occurred in 1986. There are about 7 thousand exhibits: declassified documents, maps, photographs, special devices, personal belongings of liquidators, items from the exclusion zone. Also, there is a three-phase diorama “Chernobyl NPP before, during, and after the accident”. Khoryva Lane, 1. Opening hours: 10:00-18:00. Day off: Sunday. Mikhail Bulgakov’s Museum. 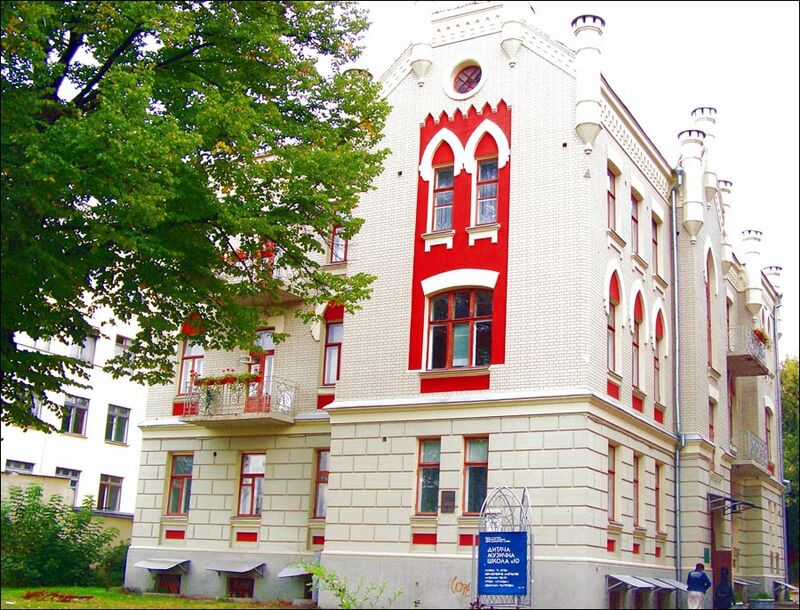 The museum is located in the so-called “house of Turbins”, where the writer lived from 1906 to 1919. Andriivs’kyi Descent, 13?. Opening hours: 10:00-18:00 (in winter 10:00-17:00). Day off: Wednesday. Ukrainian Genocide Holodomor Memorial Museum. The memorial complex of the victims of Holodomor in Ukraine (1932-1933) is located in Vichnoyi Slavy Park. Opening hours: 10:00-18:00 (Thursday-Saturday - 12:00-20:00). Day off: Tuesday. Lavrska Street, 3. 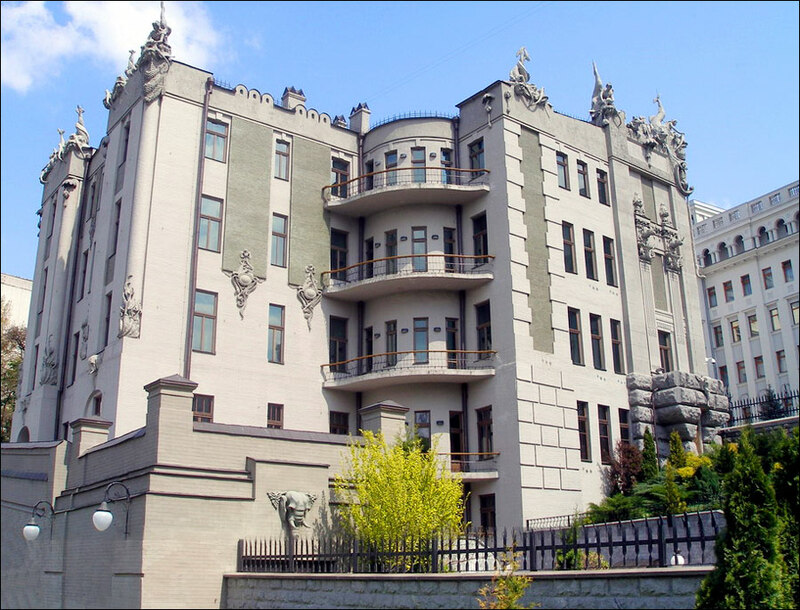 House with Chimeras (1903) - one of the most extravagant buildings of the architect V. Gorodetsky (he lived in this house until 1920). The house is located on a steep slope, that’s why it has three floors on one side and six floors on the other. The facades are decorated with intricate sculptures on the themes of ancient myths and hunting. Bankova Street, 10. 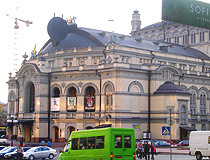 National Opera of Ukraine (1898-1901) - one of the most famous opera and ballet stages of Europe. The building was constructed in the style of the French Renaissance. Volodymyrska Street, 50. National Bank of Ukraine (1905) - a magnificent building in the style of the Italian Renaissance. On Wednesdays and Fridays, after 14:00, you can go on a tour to the Museum of Money, a preliminary written request is required. Instytuts?ka Street, 9. House of the Weeping Widow (1907) - a mansion built in the Art Nouveau style. The facade is decorated with a sad woman’s face. During the rain, it looks as if she is crying. Hence the name of the mansion. Liuteranska Street, 23. Mariyinsky Palace (1750-1755) - an impressive building in the Baroque style, one of the most beautiful palaces in Ukraine. 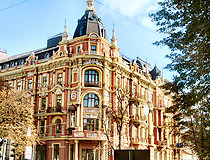 Excursions are organized by the Museum of the History of Kyiv (Bohdana Khmel’nyts’koho Street, 7). Hrushevskoho Street, 5A. Golden Gate (1037) - one of the few monuments of fortification of old Kyiv reconstructed for the 1500th anniversary of Kyiv in 1982. Volodymyrska Street, 40?. Opening hours: 10:00-18:00 (from May to September). Volodymyr The Great Monument (1853) - the oldest sculptural monument in Kyiv, one of the symbols of the city located in Volodymyrska Hill Park. Volodymyrs’kyi Descent, 6. Bohdan Khmelnytsky Monument (1888) - one of the oldest and most outstanding Kyiv monuments, another symbol of the city. Sofiyskaya Square. Founders of Kyiv Monument (1982) - a monument to the legendary founders of Kyiv (three brothers Kyi, Shchek, and Khoryv and their sister Lybid) located in Navodnitsky park, on the bank of the Dnieper River. Andriivs’kyi Descent - a historic street connecting the Upper Town with Podil (the Lower Town). This cobbled road twists steeply between old one and two-story houses. Here you can feel the spirit of old Kyiv. There are a lot of interesting places on this street: museums, theaters, art galleries, antique and gift shops, restaurants, and cafes. 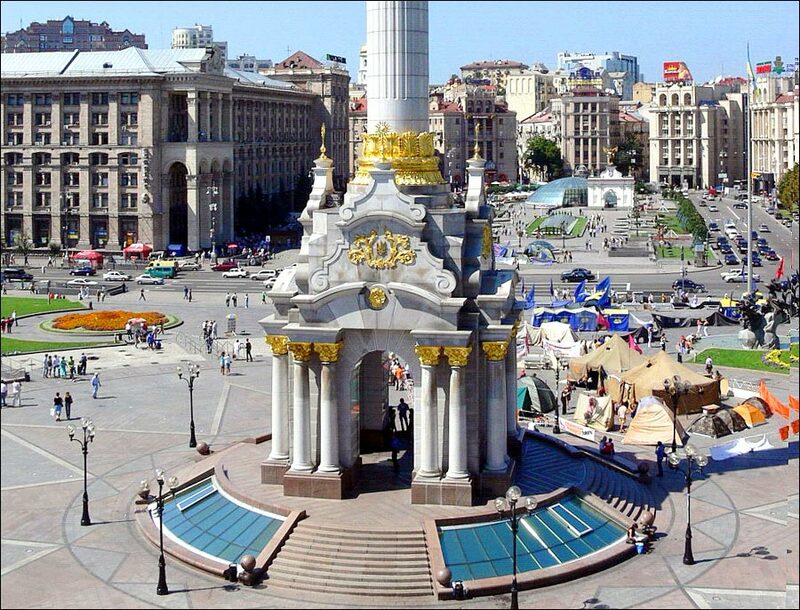 Maidan Nezalezhnosti (Independence Square) - the central square of Kyiv that has become the symbol of Ukrainian freedom. The main events related to the history of independent Ukraine took place here. 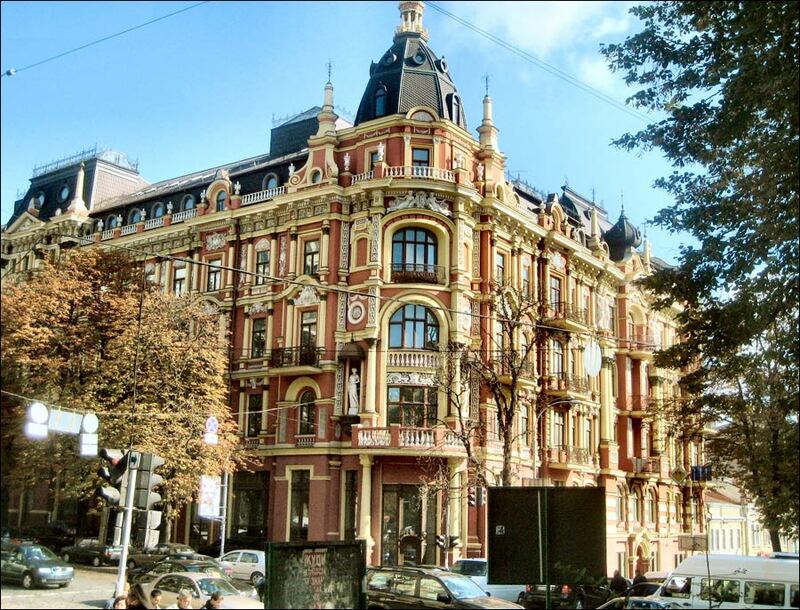 Khreschatyk Street - the main street of Kyiv, the most popular place for walks from the 19th century and to our days. On weekends and holidays Khreschatyk is turned into a pedestrian street. Concerts and other events are held here. Peizazhna Alley - an alley located in the historical heart of Kyiv. The alley lies along the line of defense structures of the 10th-13th centuries. 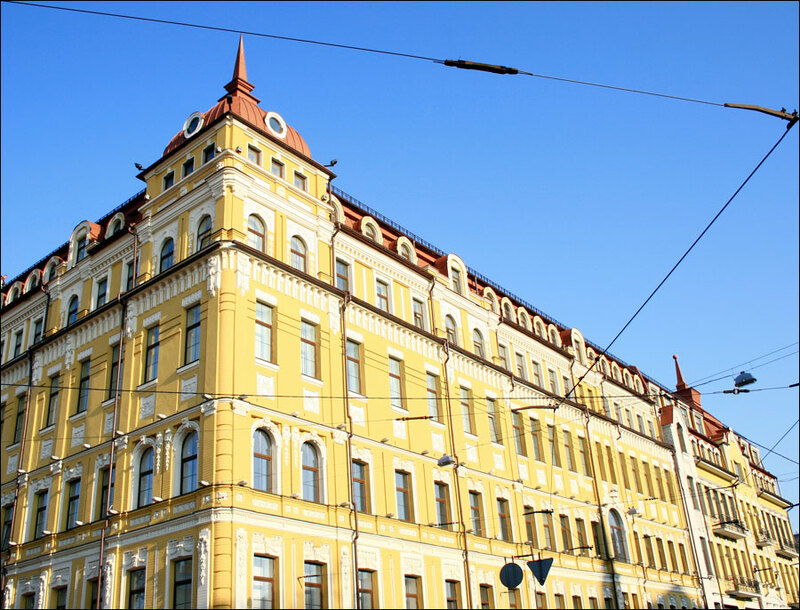 From here, from the elevation of the historical Upper Town, you can enjoy picturesque views of Podil. The alley is decorated by bizarre fairy-tale characters made by the sculptor Konstantin Skretutsky. Kyiv Cableway. In 1905, this exotic rail transport directly connected the Upper Town with Podil. Today, it is a popular tourist attraction. Volodymyrs’kyi Descent, 3. Opening hours: 7:00-23:00 (on weekends - from 8:00, in winter - until 22:00). Kontraktova Square. In the 13th-18th centuries, this square was the center of Kyiv and the main place for trade fairs. It is a picturesque historical place with a lot of architectural monuments. Here you can feel the spirit of old Kyiv. June asks: How far away is Kyiv from the unrest in Eastern Ukraine? The border of the conflict zone is located about 700 km southeast of Kyiv. Otokhine divine favour asks: I already got into Bogomolets and I will be in Ukraine in about a month. I would like to know if there are any job opportunities or better still any modeling company that will accept a black model. I want to know if its possible to open an online bank account so I can transfer money to it from Nigeria. You should try to get in contact with Kyiv modeling agencies, I have found several sites (first, second, third). You can't open a bank account online in any of the banks in Kyiv if you are not yet a customer of this bank. So when you come to Kyiv, you will be able to do it. This list of Kyiv banks will probably be useful.